Keeping our hair healthy whilst trending with all the current celebrity’s perfect styles, is very important to most of us but can also be hard work. Therefore, it’s vital to know which products are known as the top protein hair masks for your damaged hair and why. In this day in age, we use so many different heated tools and products that damage our hair daily, sometimes without even realizing. From having our hair chemically straightened to simply blow drying our hair, over time this weakens and damages the hair follicles and form gaps throughout the follicle which is where our protein masks come into place to rescue your hair. Firstly, let's explain how it can very simply regenerate your damaged hair. Proteins are molecules that are produced from washing your hair and will last from one wash to the next but sometimes more protein is needed to fill in the missing spaces where the hair has been damaged or even missing some amino acids giving it less porosity and causing gaps. Keeping your porosity levels high, will help create a lovely strong, healthy, length of hair. It is very important to consider that too much protein isn’t great for your hair, it can almost fill too much into those gaps from the damaged follicle and cause it to break off. So, it’s essential that you follow each individual instruction of how often and how long to leave the hair mask in for as the instructions are there for this very important reason. 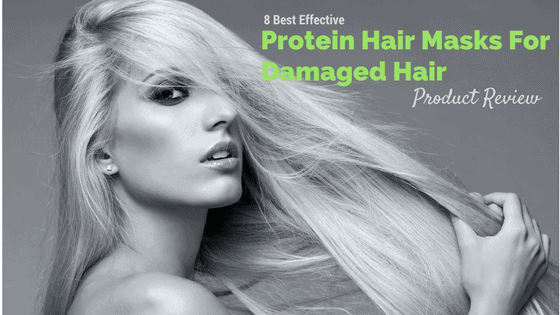 Now let’s get to the fun part which 8 protein hair masks are the best for damaged hair and why? Below I am going to have a countdown from best to worse – good luck! This Art Naturals Argan Oil Hair Mask is one of amazon no1 best seller and has 830 customer reviews which is always reassuring with a star rating of 4.5. With all the benefits from this hair mask, it is great value for money and well worth the investment. This mask provides completely natural conditioning such as the kernels of the Moroccan argan tree, which give you the argan oil which helps improve hair’s textures, softness, manageability, and shine. This product contains keratin proteins which help to build strength back into the damaged follicles, it will repair those damaged locks within no time. If you're still unsure whether to choose this hair mask this brand offers 100% money-back guarantee if you’re not satisfied with their product. This gives such confidence that this product is as great as everyone is saying, so give it a go. 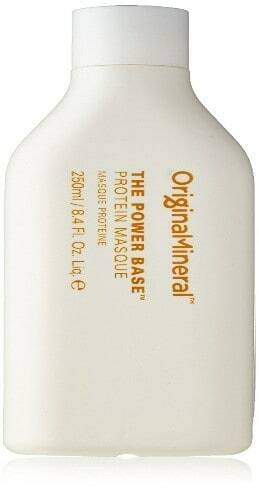 Original & Mineral the power base protein masque is a unique protein mask as this is specifically designed to be colour safe. It contains UV Protectors that are designed to prevent color fade. This product contains wheat protein which helps strengthen fragile and damaged hair. It also contains apricot kernel oil which is a natural oil that helps to infuse moisture whilst nourishing the hair. This is one of the most expensive hair masked I have reviewed which I think is fully justifiable to spend on a product that can offer so much especially if you spend a lot of time and money on colouring your hair you will need a product like this that will protect that colour and not strip it. So, if you colour your hair and it’s starting to look dull and straw like this is your product, especially when it's only recommended to be used once a week, this bottle would last a lifetime. 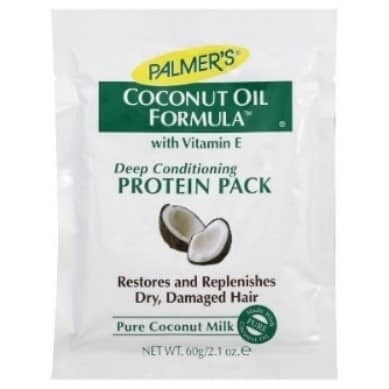 This travel size sachet of palmers coconut oil protein pack is perfect to replenish your hair, even if you travel on a regular basis as this can easily pop straight into your wash bag. Under £3 a sachet this is amazing value for money as it is recommended that one sachet will last around three washes, with it only needing to be applied once a week, this is an incredible price. This deep conditioning protein pack is different from others as not only does it contain keratin and silk proteins but it contains vitamin e which helps restore and replenish dry, damaged hair. As Palmers is a very well recognized brand I am not surprised it has made it into my list of favorite hair masks. It has great value for money, a lovely coconut scent and comes in a travel size sachet. 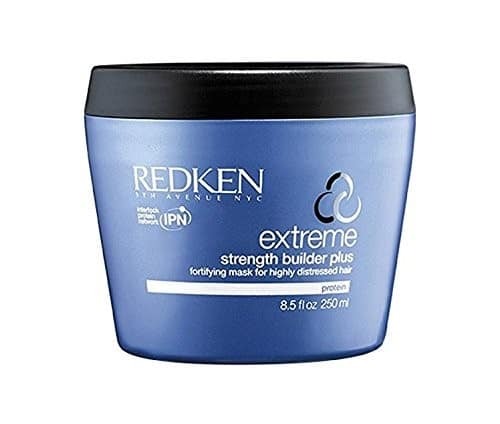 This product is a strength building hair mask and is recommended by many professional hairdressers as this mask contains silk proteins which are proven to help your hair grow faster. Described as a miracle rescue for your hair, it helps repair your damaged hair and give that healthy glow you are looking for. It has an impressive 4.5-star rating and is highly recommended. Although this product is a little higher in price than others, you will only need a tiny amount to massage into your hair, so would last you longer than you think. After you have shampooed your hair, you only need to leave in for 5-15 minutes and rinse. L’anza KB2 Protein Reconstructor is a gentle coconut based cleanser that contains nutrients and protein that helps with repairing damaged hair. As this is cleanser rather than a mask, you will need to apply it onto wet hair so best to include it into your routine of washing your hair every few days. Many customers feel they noticed a difference after only one wash, leaving their hair looking and feeling healthy. It is also known for its lovely, long lasting coconut scent it leaves behind. At a reasonable price, it’s not too expensive for a great smelling, easy to use, shine leaving cleanser it’s worth the investment to give your hair the protein it needs. 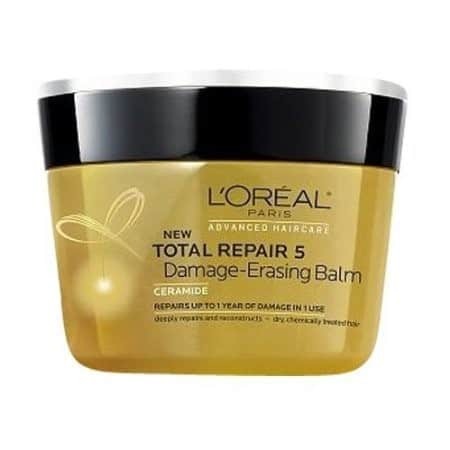 This L’Oréal haircare erasing balm instantly repairs the 5 signs of damage; 1. split ends, 2. weak, 3. rough, 4. dull 5. dehydrated. This hair mask contains ceramides and application of natural ceramides to damaged hair improve the scale of the hair cuticle and restores the natural properties of the hair, helping it achieve the shine you are searching for. With a well-deserved 4-star rating on amazon, this hair mask is retailed at an average price, this product claims it not only repairs and reconstructs your hair but repairs up 1 years’ worth of damage in one use of the product. Impressive. 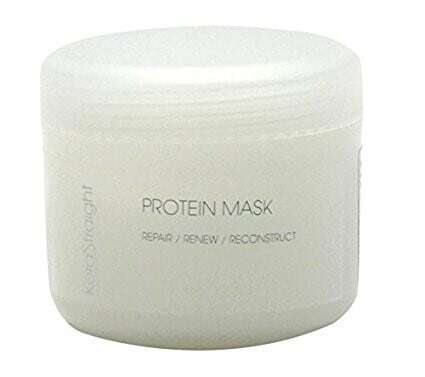 Kera straight protein mask is packed full of low-weight proteins which help to create a net over those damaged hair follicles that have created holes through the follicles, this should help form strength and prevent any split ends and breakages. Although it is at the higher end of the market with its pricing, this is one of the very few products that has the low-weight of protein which makes it stand out from other products like this. With a star rating of 4 and plenty of pleased customers with outstanding reviews it well worth investing in. 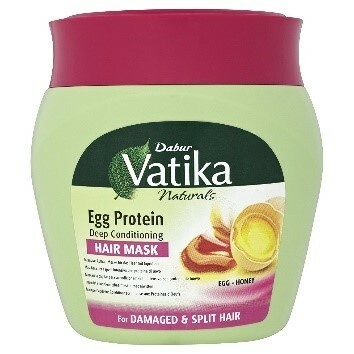 The Dabur Vatika naturals egg protein deep conditioning hair mask is an outstanding product for anyone with damaged hair. The main purpose of this hair mask is to help repair your dry and damaged hair and turn it into soft, silky, healthy hair. It has outstanding reviews , stating that within 4-5 uses they have all seen a massive difference and couldn’t live without this product. Simple apply post wash/ shampooing your hair and leave on for 15 minutes, wrap in a towel and rinse. Easy. All in all, this is a great purchase, hearing all the tremendous reviews and fabulous results, it is well worth a go in our books. Especially all for under £6, its most defiant value for money. 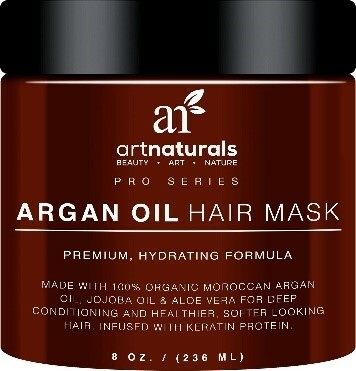 Overall, Art Naturals Argan Oil Hair Mask is a clear winner when looking for the best protein hair mask for damaged hair, not only is it proven by being one of amazon best sellers but the fact that it uses all natural products, includes keratin protein, has great value for money, as well as 100% money-back guarantee, this is just an incredible deal. But if this one isn’t for you, I have given my best pick from the top 8, at least one of these products will reach your individual needs. Happy choosing!